Four years ago, Asha Soares’ grandmother fell ill, starting a wave of visits, appointments, and consultations with doctors and specialists. It was a difficult and worrying time, not least because her family was so concerned about her grandmother’s health, Soares remembers. Two years later, that experience led Soares to co-found Kabuk, an Etobicoke, Ont.-based startup that aims to connect people with healthcare providers like family doctors, dentists, physiotherapists, and so on. That part of its service went live two to three months ago, also offering people the ability to book appointments online based on a doctor’s hours and available time slots. Now, in a push to move beyond healthcare, Kabuk is turning to the legal space, hoping to offer a similar service for people looking for lawyers to represent them in court or to provide legal advice. The company has opened up a beta program for any lawyers who sign up, giving them three months’ free access to the site. Basically, Kabuk’s service works like this: A user goes to its site on the hunt for either a healthcare professional or a lawyer. They can search for professionals based on a number of factors, including location, language, gender, and specialty. For example, a healthcare professional might specialize in sports-related injuries, or a lawyer might focus on family law. Once they find the right professional, they can book their own appointment through Kabuk’s system based on the professional’s availability. Kabuk will then send an email to both parties and if they agree to it, the appointment will be made. This saves both clients and professionals a lot of time, Soares says. She adds she has friends who have tried to find professionals through YellowPages, calling as many as 20 to 30 offices and still not getting a response – and for professionals, using Kabuk can be easier than trying to drum up business themselves. Even if they use Google AdWords, or try to improve their search engine optimization, so they’re higher up in organic search results, that doesn’t mean they’re necessarily the best fit for the people who are searching for them, she says. “The information that I’m seeing is showing me how much people are willing to pay to be found, rather than, are they the right person that can deal with my needs,” she says, giving the example of one family lawyer who might specialize in divorce, while another who is skilled in navigating adoption procedures. 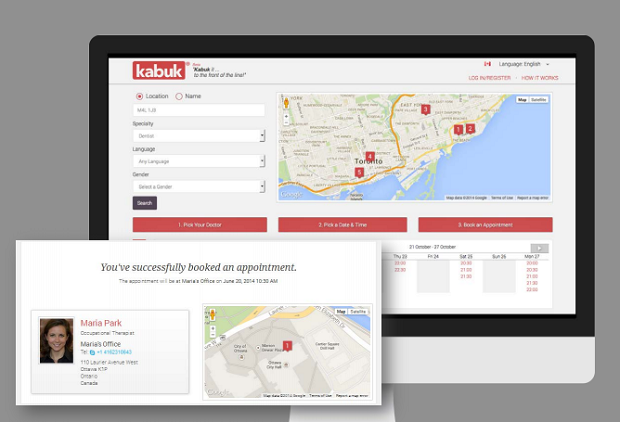 For users searching for professionals, Kabuk will always be free. Healthcare providers can also post free profiles. However, the startup makes money by charging them $50 a month for full access to its platform, which includes the ability to book appointments. Legal professionals get charged a little more, with pricing set at $75 a month for profiles and $100 a month for booking services, as they tend to command higher consultation fees. Kabuk has been in beta for the past two to three months within the healthcare space, with between 30 and 50 healthcare professionals signed up so far, Soares says. However, it was always Kabuk’s goal to expand into other verticals, including legal services. Soares wouldn’t say which industries it will tackle next, but she did say plans are in the works to reach out to other types of professionals. Kabuk also hopes to add analytics to its platform in the future, allowing professionals to track their visitors and profile views.